A couple of years back now, and many posts ago, I wrote about the history of saison beers. At the time saisons or farmhouse ales were somewhat of a novelty but like many great fads saisons appear to be enjoying a bit of a renaissance this craft beer season. So here is a bit of my original post on the origins of the style. Saison is French for season and it was believed saison style ales were brewed in the autumn or winter for consumption during the following summer’s harvest. However, according to Mosher’s Tasting Beer the current story about saisons being brewed to sustain workers during the labour season, while quaint, is not exactly historically accurate. Rather the term saison applied to the eccentric beers of Liège as well as the beers of Mons in an area now known as the Saison region. The commonalities uniting these beers were the ingredients used, saisons being brewed with a regional yeast strains, malt, wheat, oats, spelt and even buckwheat or broad beans, and not the coalitions of thirsty farmers and their intrepid beer-brewing wives – though personally I find the farmer version much more romantic. Mosher suggests that fast forward to the twentieth century and the modern day versions of these saison beers may or may not contain wheat, tend to be bottle conditioned and have a higher ABV. One of the defining elements of this newly named style is the yeast, a ‘slow cranky’ strain believed to be related to red wine yeast. This yeast is quite heat tolerant and produces lots of peppery phenols. Spices are optional but pepper, orange, malts and grains of paradise are sometimes added. 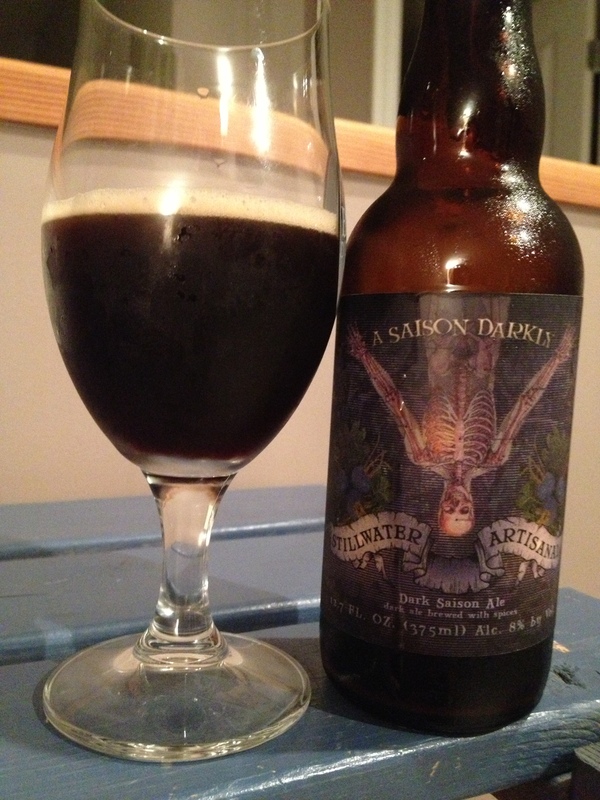 While I don’t have much new to report on the historical origins front I have tried a saison worth blogging about, A Saison Darkly from Stillwater Artisinal Ales. This is the first beer I have tried from this brewery but I am a long-time admirer of the incredible artwork adorning the labels of their beers and I was intrigued enough by the promise of a dark take on the saison style to bring one home. A Saison Darkly 8% ABV (great beer name to go with a gorgeous label) pours dark brown black with lots of mocha coloured head on the initial pour. There is pretty decent head retention on this beer. Lots of sediment remains in the bottom of the bottle, most decidedly the mark of a good saison, and there is a bit of cloudiness and sediment in the glass. A funky yeasty nose but there is also a coffee chocolate dark beer element to the nose. First couple of sips and this beer speaks more to the dark beer character rather than the farmhouse. I find the saison style gets a bit overwhelmed by the roasty malty character of this beer but that does not necessarily mean this is an inequitable partnership. As you drink the yeastiness comes through now and then reminding you you are not drinking a straight-up porter. Overall I think this is a great blending of styles and I look forward to sampling more from the Stillwater line-up. 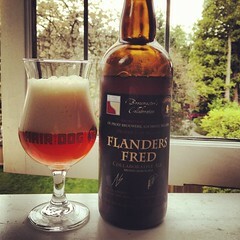 This entry was posted on Thursday, August 15th, 2013 at 9:13 pm	and tagged with A Saison Darkly, Beer History, Dark Ale, Farmhouse Ale, Saison, Stillwater Artisanal Ales and posted in Beer History, Beer Reviews, Dark Ale, Saison. You can follow any responses to this entry through the RSS 2.0 feed. I have been meaning to try this beer. Sounds like it is worth trying. Coming together over craft beer.